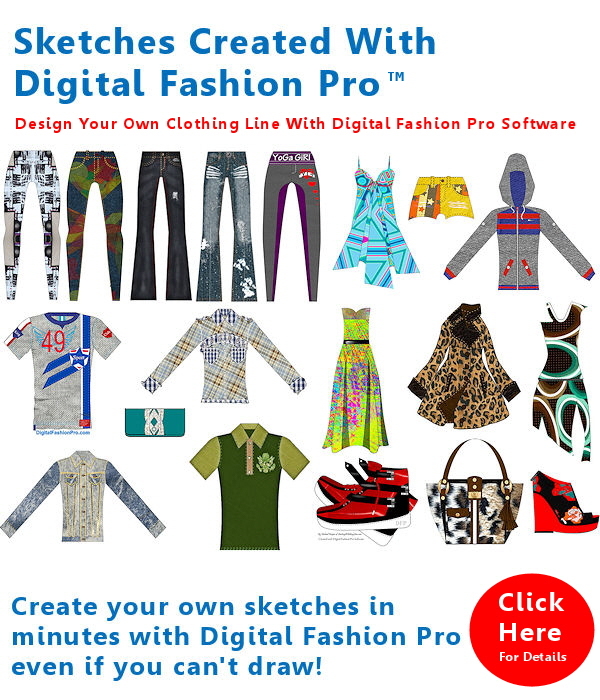 Q: I Can’t Draw, I’ve Never Designed Before, Never Used Software Before – Can Digital Fashion Pro Still Help Me Become a Fashion Designer / Design Clothing? You do not have to know how to draw to be a fashion designer or create your fashion designs. In fact, it is required within the industry that you are able to create digital designs at some point in the design process. Using Digital Fashion Pro allows you to create your designs without knowing how to draw. While hand-sketching is great to show off artistic skills – the industry absolutely relies upon accurate digital design especially in manufacturing. This is why Digital Fashion Pro is perfect for people who can or can’t draw because it allows all users to create manufacturer-ready fashion sketches. If you can draw great – but in the end – fashion design is all about accurately conveying your vision and Digital Fashion Pro helps you do just that with precision. If you have been thinking you can’t get into design because you can’t draw – think again! Still Have Questions? Is Digital Fashion Pro right for you or your company? The truth is – you can make it being you – whomever you are and with whatever skills you may have! With your passion, the right resources such as our Fashion Design & Business Resources and your eye for fashion – you can become a successful fashion entrepreneur and designer. Give yourself the chance to fly!